Is America headed to decline and collapse? Thousands of years of history tell the story of empires that have risen and fallen. Is America next? What can patriotic Americans do about it? Do the 1776 Founders of America have the answer? We must continue to learn from our history to assure a strong and viable nation. Tom offers his considerable thoughts on why the decline of America started years ago, how the current administration is speeding it, and what patriotic Americans can do to reverse the decline and prevent the collapse. 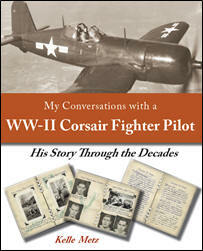 WW-II Corsair Fighter Pilot - His Story Through the Decades. 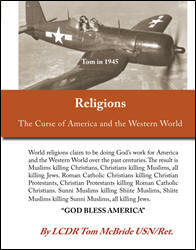 World religions claim to be doing God’s work for America and the Western world and the result is Muslims killing Christians, Christians killing Muslims, all killing Jews. Roman Catholic Christians killing Christian Protestants, Christian Protestants killing Roman Catholic Christians. Sunni Muslims killing Shiite Muslims, Shiite Muslims killing Sunni Muslims, all killing Jews. If you consider purchasing this book it means you are not an "average normal American". Accurate polls of various nations have proven average normal Americans know less about history, science, the universe, space, religion and politics than residents of all other first world nations. So, I am suggesting that you check Google, Wikipedia, and You Tube and discover more about the people mentioned in this book: Benjamin Franklin, President Thomas Jefferson, Author Thomas Paine, Scientist Carl Sagan of Cosmos, Professor Tanya Luthermann of Stanford University, Professor Bronowski (producer of "The Ascent of Man"), Richard Dawkins, Charles Darwin (biologist and scientist who formulated the theory of evolution), Sunand Tryambak Joshi, Professor Carl Van Doren, and Baruch Spinoza. You will enjoy getting to know these great people and what they have to say on the subject of religion and politics. "If God were alive today, He’d be an atheist,"
"There never was a god of this tiny planet earth and there never ever will be. The Christian and Islamic gods are man-made myths about gods that never existed." Ancient storytellers gathered folk stories into a book called "The Bible" which without a doubt is the best-selling work of fiction in the past 2000 years. GOD BLESS AMERICA and to hell with the rest of the world. This book includes historical maps and photos, along with engaging text about the Commander's WW II adventures as a fighter pilot. It also includes his thoughts on evolution, fictitious religion, what to do about the "enemy within", and thoughtful suggestions on how to return America to its former greatness. The Commander is available to give talks. Click here to contact him. This website is sponsored by the Thomas Jefferson Humanist Society. Thanks to the brilliance of the United States of America’s 1776 Founders, all citizens have Freedom of and Freedom from Religious Beliefs.